LISA Pathfinder lifted off from Kourou on a Vega rocket at 12:04 a.m. EST (4:04 a.m. UTC) on Dec. 3, and is on its way into low Earth orbit. 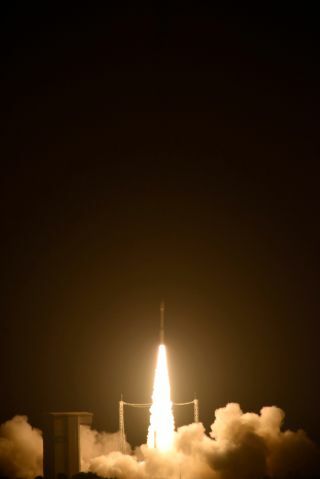 In a long-running quest to find gravitational waves in space, the European Space Agency (ESA) successfully launched a mission yesterday (Dec. 4) to test wave-finding technology. The mission is called LISA Pathfinder and will not actually search for waves itself. Rather, the mission will serve as the trailblazer for the technology scientists hope will help find these ripples in space-time. ESA plans to launch a later mission in 2034, which would actually search for gravitational waves, but the design for that mission has not been finalized. The LISA pathfinder mission is needed because the usual ground tests can't predict certain things about how the full experiment will operate, according to a statement from ESA. That includes aspects such as the effect of cosmic rays on the measurements, said Paolo Ferri, ESA operations head, in a live stream archived on the agency's website. "There were some things that we can't test with this future mission, so we had to go to space. That's where LISA Pathfinder comes in," he said. Gravitational waves were first predicted almost exactly a century ago. Albert Einstein's general theory of relativity, published Dec. 2, 1915, predicted space-time would have ripples, also called gravitational waves. While Einstein wasn't convinced these waves could be found, scientists now believe it could be possible using two identical gold-platinum cubes inside LISA Pathfinder. The cubes will be placed into free-fall, and then their positions will be monitored with lasers to as high a precision as possible. The goal is to measure the pure movement of the falling cubes, minus the influence of external forces and spacecraft movements. In the LISA experiment, scientists hope to measure movements in the cubes caused by gravitational waves, the statement said. "We're doing something that has never been tried before," said Alvaro Canete, ESA's director of science and robotic exploration, in the same briefing. The mission is expected to reach L1 about 10 weeks from today (Dec. 4), in mid-February. Its six-month science mission will begin in March, once checkouts are performed. LISA Pathfinder's name is a holdover from an older mission concept studied by ESA, the Laser Interferometer Space Antenna (LISA). While the concept was put forward for a launch date, it was not selected — nor was another idea called the New Gravitational wave Observatory (NGO).